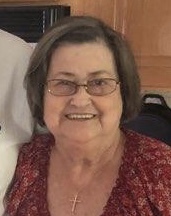 Brenda Kay Millsaps, 69, went home to be with the Lord on Tuesday, September 11, 2018 at her home in Middletown, Ohio. Brenda was a native of Graham County and was the daughter of the late Lloyd and Willa Mae Millsaps. In addition to her parents, she was preceded in death by her infant siblings, Junior Millsaps and Kim Millsaps. Brenda is survived by her daughters, Stephanie Armes and her husband, Travis of Middletown, OH, and Kelly Prince of Franklin, NC. Brenda was so proud of her six grandchildren, Kris Prince, Jordan Myers, Skylyn Myers, Brooke Pendergrass, Rylee Armes, and Olivia Armes. She has two great grandchildren, Addison Prince and Harley Leehan. She is also survived by her brothers and their wives, Roger and Joann Millsaps of Robbinsville, NC, and Chris and Ginger Millsaps of Orlando, FL, and several nieces and nephews. Her greatest joy in life was to be around family and listen to the stories of their youth and be able to watch her grandchildren experience their day to day lives and be a part of their journey. She was seldom referred to as Brenda, because her grandchildren lovingly named her Gangy; that name always brought joy to her face and a smile to her lips. In memory of Brenda, there will be a Celebration of Life Service at 2:00 pm Saturday, September 22, 2018 at Sweetwater Baptist Church in Robbinsville, NC.